Selecting new cricket bats, whether you are 8 or 48 always has that special buzz and kid in a candy shop feeling. It’s always great to see our younger customers coming in with thier elders, all ready to try out a selection of bats and with a wealth of knowledge, from all the reading up they have done on all the latest models. To give a quick insight into bats, they basically start from a size 0 and go up to a H which stands for Harrow. So the full size range of junior bats is as follows: 1,2,3,4,5,6 and Harrow. In addition to these sizes, some companies such as GM also carry the academy size and others carry what they call the small men’s size. These bats are basically for the elder junior player that has outgrown a Harrow but is not quite big enough and strong enough to use a full sized bat short handle bat. The academy and small men’s bats may also be used by ladies. For senior bats we nowadays tend to see Short Handle, Long Handle and Long Blade Bats. Over 90% of the senior bats we sell are Short Handle models. These tend to suit players up to 6ft in height and for those that are taller there are the Long Handle and Long Blade options to choose from. Long Handle bats have the same length of blade as Short Handle bats, but the handle length is around an inch longer. With Long Blade bats the handle is the same as a short handle, it’s just the blade that’s a little longer. Having the slightly longer blade means taller players don’t have to bend down as much and can be a little more upright in thier stance. For juniors, getting the right size bat is very important and key to really enjoying the game and being good at it. There can sometimes be a tendency to buy a slightly bigger bat in the hope and expectation that the young player will grow into it. However this can be a false economy as the bat can be too big, rather heavy and instead of playing with enjoyment, they actually get put off the game and the bat remains in almost unused condition for many years to come. A bigger bat will weigh more so may prove to be a little too heavy for the young player and then the added length of the bat may well mean that the handle jabs into the wrist area and cramps the batsmens play. I would much rather a bat be the right size and be completely worn because of the sheer number of runs scored with it, rather than it be too big and it be used over the next 2 seasons and still look like new. Runs mean success. Although this can vary, to give you an idea, a size 4 bat would typically be used by a 9 year old. So once you have the size worked out, be this in terms of the junior or senior sizes, your next decision should be as to whether you opt for a Kashmir or English willow bat. For senior players, we would say keep away from Kashmir willow bats as they are a waste of money. They tend to be heavy, don’t perform well and don’t last either. Invest in an English willow bat and the extra money you spend will be well worthwhile, as not only will the bat play a lot better, but it will last a lot longer to. As for junior Kashmir willow bats, these are fine for players using a soft ball or those using a hardball that are just getting into the game and want to make sure they enjoy it, before investing more money into an English willow bat. For those who want better performance in buying in English willow bat will certainly reap its rewards as the whole play and feel will be considerably better. Now we come to the price ranges. For a junior Kashmir willow bat the prices tend to be around the £30 mark. Now this will be for a good quality Kashmir willow that will feel light. For an English willow bat the prices tend to start from around £60 and can go up to £250 for the very best quality ones. We carry senior bats starting from under £100 to those nearing £600. All of those bands will come in a variety of weights and pick up, so there is ultimately a bat for every type of individual. The most important thing when getting a new bat is how it feels when you lock it up. So that’s why we always tells customers to consider a few different model bats within thier price range and then go for the one that’s the right weight and type for them. 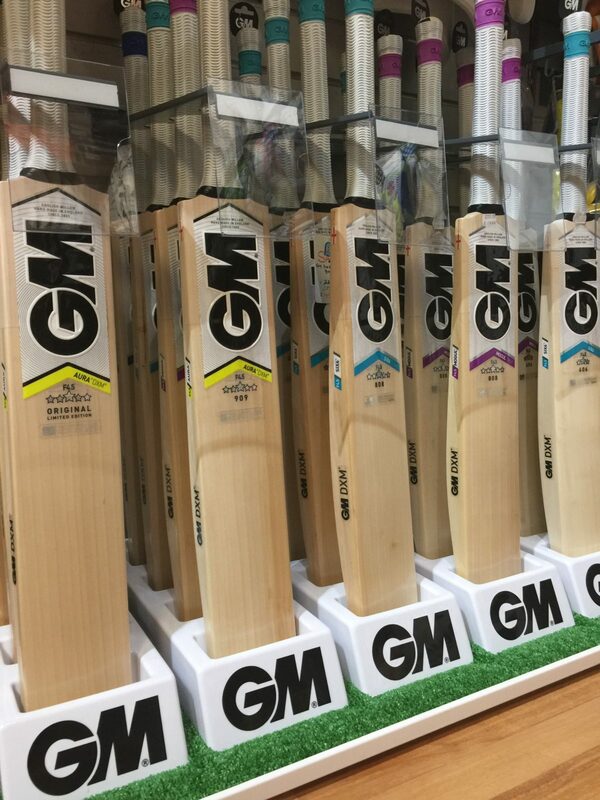 If you’re buying online then that’s what we’re here for as our many years of experience is on hand for you, helping you to select the right bat. If you coming to our store you’re able to choose at your leisure and of course one of our specs expert is always there to give thier quidance.